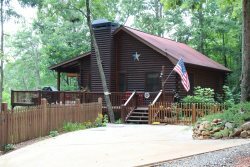 Located less than 15 minutes from Blue Ridge, GA, My Mountain Escape is a 3 bedroom, 3 bath private cabin sitting on 2.5 acres with pretty mountain views. My Mountain Escape is a 3 bedroom, 3 bath private cabin sitting on 2.5 acres with pretty mountain views. The Master Suite is located on the upper level and has a King size bed, and a Jacuzzi tub. There is a Library in the loft area with a pull out sofa sleeper. The second bedroom is on the main level and has a queen size bed and full bath. Downstairs you will find the third bedroom with a Queen size bed and full bath, a queen sofa sleeper, set of bunk beds, game room with pool table, foosball table, piano, and TV (basement is partially finished). Additional amenities include gas log fireplace and SAT TV in every room (5 TV's total with Direct TV service), fully equipped kitchen with dishwasher and microwave, dining table with seating for eight, kitchen bar with four stools, screened porch, ceiling fans, rockers, and a picnic table, large private hot tub with seating for six persons, gas grill, central heat and air, and a washer/dryer. Sorry, My Mountain Escape does not allow pets. Nearby attractions include hiking the beautiful trails of North Georgia, biking, Antique Shopping, White Water Rafting, Horseback Riding, Scenic Train Rides and the famous Swan Drive In. All our cabins include linens, dishes, pots, pans, towels, washcloths, etc... We will provide an initial supply of guest soaps, toilet paper, dishwasher detergent, paper towels and trash bags. Very nice cabin in a great location. Very convenient to both Blue Ridge and Meeks Park in Blairsville. Wonderful! Can't wait to book another trip! Plenty of things for the family to do and plenty of space for everyone!! Had a great time, would definitely come again! Loved the chalkboard wall! Huge space with a a great and private location. We had a great time! Would come again! The overall trip was amazing and so relaxing. Having the fire place on was my favorite thing. It is great to be able to get away and relax with friends and family!! My friends and I had an amazing time getting together and relaxing! The place was super nice and comfortable, my favorite thing was sitting next to the fire while watching tv. The place is equipped with mostly everything but I would advised to make sure to read the instructions because there are some toiletries and kitchen items that are very limited and the closest Walmarts or grocery store isnt for almost 8 miles away. I wish the beds would be bigger and not so firm. But overall the experience was amazing and I would so come back to this cabin! Best cabin for big families!! We enjoyed our time away from the hustle and bustle of daily life. Spending time in the cabin made us feel rested and rejuvenated. We found ourselves not rushing to explore the mountains but staying an extra hour to enjoy the tranquility. We rented the cabin to spend quality time with our kids. We had a wonderful time and had plenty of space to spread out. We love the cabin and can't wait to come back. We also love seeing all the deer around. It was quiet and peaceful, just what we were looking for. Thanks for a great weekend! I actually only corresponded through email. The stay was enjoyed. I would definitely stay here again. The nice young lady at the front desk was so very nice and helpful in finding a nice cabin for us. We were so thankful and blessed. The cabin was perfect for out women retreat and we had a wonderful time.